Cancer research is accelerating at a rapid pace and has begun to deliver clinically, with several breakthrough therapies recently winning FDA approval. In addition to advancing our understanding of cancer biology, strong relationships between drug developers and clinical researchers remains critical. 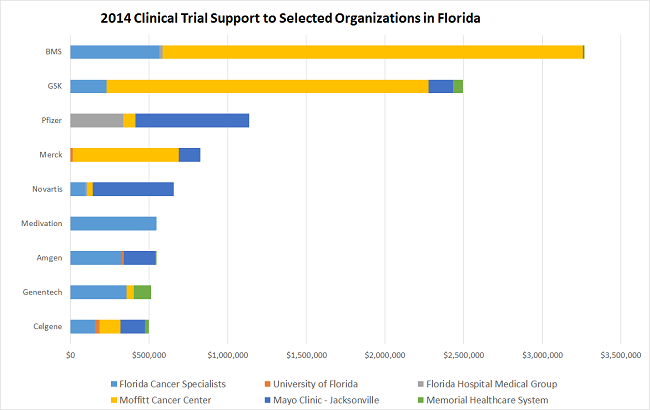 In the chart below we highlight industry support provided to leading cancer research institutions in Florida. While the total dollar spend does provides some insight into the relative magnitude of company investment by institution, it’s important to understand that included dollars can represent a range of items (e.g., clinical supplies, analytical testing, patient support/management, and trial oversight). What is encouraging from our perspective is that most major companies have relationships with several of the selected institutions, suggesting a collaborate approach to clinical development. In addition to connecting with innovative institutions, coordination at the physician level is paramount. Although all oncologists share a common educational background, expertise and clinical focus can vary. To illustrate this point we’ve highlighted research activity from several individuals at Florida Cancer Specialists, a large independent network with over 170 active physicians. Note: A shaded square indicates that the researcher received industry support for a trial in the corresponding disease area. Importantly, some individuals show activity across a mix of tumor types, whereas others tend focus within hematological malignancies or solid tumors only. How we can help: MDDetails tracks clinical activity and trial participation of over 4,000 U.S. investigators. We can help emerging and established organizations identify researchers with the relevant experience and expertise to support drug development.